Patient Advocate and Avid Tandem Cyclist to Lead Change at Asthma and Allergy Foundation of America (AAFA). Kids With Food Allergies is a division of AAFA. WASHINGTON, Sept. 25, 2014 /PRNewswire-USNewswire/ -- When the Asthma and Allergy Foundation of America (AAFA) appointed Cary Sennett, MD, PhD, FACP, as its new President and CEO earlier this summer, they expected he would get right to work helping to shape a vision and strategy for the nation's oldest and largest patient group for people with asthma and allergic diseases. For Cary Sennett and his wife, Sara, tandem cycling is a weekend sport and a workday philosophy. "We knew Cary would be a good leader for AAFA. His broad background working with payers, providers, professional associations and the policy community all aligned around the needs of patients gave us confidence that he could hit-the-ground running," says Lynn Hanessian, Chair of AAFA's national board of directors. And hit-the-ground-running he has, laying out a strategy for AAFA's Board of Directors to consider at their meeting in October, to move AAFA in exciting new directions. At the same time, he has hit-the-road cycling. 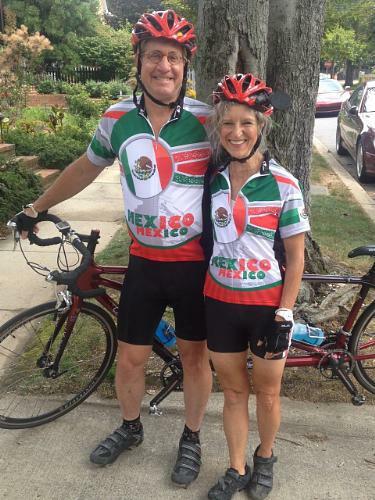 An accomplished and competitive athlete, Dr. Sennett and his wife have been avid tandem cyclists for more than 25 years. "Tandem riding is a joy and passion that helps me stay fit, relax and spend time with my wife, Sara," says Dr. Sennett, "but it's also a serious metaphor for how I want to run an organization. I believe success happens only when you know exactly where you're going, when you have a clear roadmap, and when everyone in the organization is working together to prepare for twists, turns and the occasional bump in the road." Dr. Sennett arrives at the nonprofit at an important time, both for the Foundation and for the asthma and allergy community across the United States. AAFA celebrated its 60th anniversary in 2013 and merged with a food allergy organization, Kids With Food Allergies (KFA), which now functions as an operating division of AAFA. Nationally, more people than ever are dealing with asthma, food allergies and related diseases. About 25 million Americans have asthma, 15 million have food allergies and 50 million have nasal allergies. These conditions affect all populations – young and old, black and white, Hispanic and Native American, urban and rural – but asthma in particular is especially a problem for families who are economically disadvantaged. These diseases are among the most common chronic conditions in the U.S., and they are also some of the most costly. The Centers for Disease Control and Prevention (CDC) estimates that asthma alone costs the U.S. over $50 billion dollars annually. Uncontrolled asthma clogs the health care system every day across the country accounting for nearly 9 million doctor visits, 2 million emergency department visits and 500,000 hospitalizations annually. "A recent research study1 found that children ages 1 to 3 years accounted for one-fifth of all emergency department visits caused by complications from asthma, representing the highest proportion of visits among asthma patients under age 21, and that charges across the U.S. totaled $2.6 billion, averaging to about $1,300 per visit," says Barbara Corn, AAFA board member and an executive at United Healthcare. "Cary's extensive background will help AAFA to continue its efforts to improve the quality of life for people with asthma and allergic diseases through education, advocacy and research." "Asthma and allergies are very unique conditions," says Dr. Sennett. "While assuring that people get the right healthcare is important, it may be even more important to create an environment that is safe, where exposure to triggers is minimized." Dr. Sennett feels strongly that this requires an educated and "activated" patient, as well as coordinated action of people in the communities where these patients live, work and go to school. "I think we know where we have to go and the scientific and patient communities haven given us the cue sheet. The real challenge now is to get everyone aligned—everyone pedaling in sync. We've got some big hills to climb. And I'm thrilled to be here to help."